...and more practice. Jokes aside, edging as you dive the kite and flatten out the board as the kite rises. Work the kite to build apparent wind. A bigger board with wide tips helps to get on the plane early. When I'm not foiling I ride a 160cm directional in light winds (Shinnster). ...and more practice. Jokes aside, edging as you dive the kite and flatten out the board as the kite rises. Work the kite to build apparent wind. A bigger board with wide tips helps to get on the plane early. 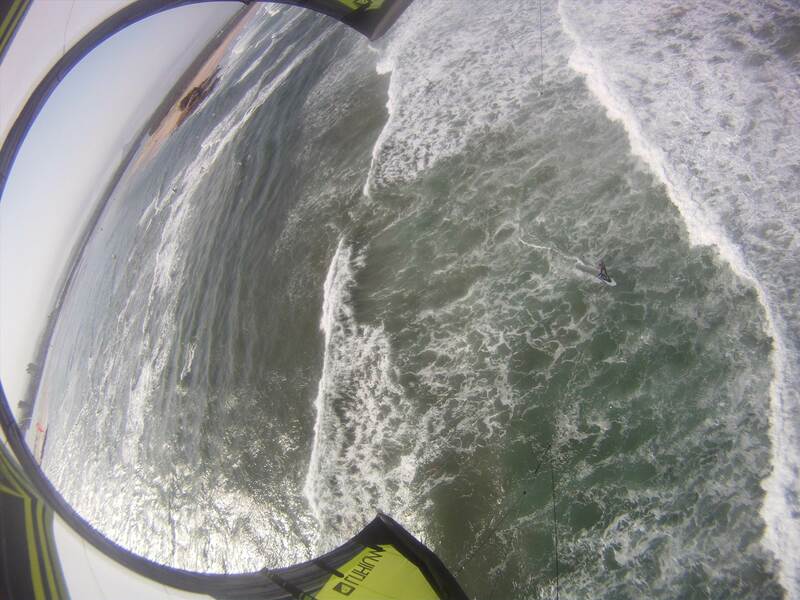 When I'm not foiling I ride a 160cm diectional in light winds (Shinnster). I think get upwind in light wind is all about Speed and efficacy. As KIT33R said flatten of the board on the upstroke and edge on down stroke also easy the bar out a little on the upstroke and pull in on the down stroke. Are you maintaining upwind? Ridiing flat water or open ocean beach break ? Ah, thats something i didnt mention. It's generally in the surf so im fighting the waves on the way out on generally a wind hitting almost dead on the beach. Will definitely try this out! You can obviously go upwind. Light winds with an 11m kite and a twinny. You can try a bigger board but I can honestly say the most likely cause is you are underpowered. Get a bigger kite. Have you tried using a surfboard? Can only say for flat water, when light wind: kite is higher and relying more on the fins to do the work. Weight more balanced on the board with a 50/50 weight distribution and stance more upright. Use the gusts to edge and make the most of them to get the most upwind you can. Stronger winds you can have your kite lower, use more edge and rocket upwind with 80% weight on back foot and 20% on front. When kiting in waves with onshore winds, every wave pushes in the same direction as the wind thereby reducing the apparent wind by the same amount as the wave speed. Could be tricky to get started but it is all about technique. Buy a bigger kite and buy a bigger board. Gotta give before you get. Giving up upwind ground to increase planing speed will always help you start to edgeharder so you can get that ground plus more back. This is a really good video that covers a lot of points that will help with getting upwind in the lighter stuff. The advice about riding as fast as you can is actually not true - you need to find the right balance between board speed and available power. Going as fast as you can does give you more apparent wind, but apparent wind also changes the direction of where the wind appears to be coming from, and that always shifts to make you go more downwind compared to the base wind direction. The guy in the video explains this a lot better than I can, but it is something I have seen a lot of learners struggle with. Also, the other tip above about really sineing the kite is correct to a point - but sineing also drops the kite back further in the window - which pulls you further down wind. Again, it's about finding the balance between speed, power and angle... which is where the tip about "practice, practice, practice...' is spot on. You want to sine the kite enough to keep it where it is giving you the right amount of power to maintain your speed - any more than that and it will be starting to pull you downwind (and beginners generally react to that by edging harder against the kite and killing its power). You don't want to be locked into an upwind angle either. In more wind, you can lock yourself in to an angle and just keep edging in that direction. In the lighter stuff, if you can feel the kite starting to lose power or choke, bear off a bit to let it breathe (flatten the board and go slightly with the kite), then when it recovers, you can start pushing more upwind again. If really you want to ride in the lighter stuff, the biggest bang-for-your-buck is a light-wind board, followed by a bigger kite. In 15-18 knots and 75kg though, you should be able to go upwind decently on the gear you have with the right technique, although the waves will be sapping your power a bit. 1. kites. A lot of beginner kites are more D or delta shaped and often referred to as "Park and ride" others are more wing shaped like say a seagulls wing this is often referred to as having higher aspect ratio = C shaped. I find Delta kites will not sine and generate as much apparent wind power as C kites. That is life with which ever kite you have... but all normal kites will sine and will generate power by getting the extra air moving over their surface. Some also have a deeper profile which allows them to fly further forward in the power window = more up wind. 2. Point 1 in the video is wrong IMO Why generating apparent wind by moving your kite makes it go more down wind does not make sense. What that is suggesting is if you can park and ride with enough power then sinning your kite to get extra power is likely to make you end up further down-wind. My experience indicates sinning your kite feels like it moves the wind direction to allow you to point further up wind = the opposite of the video diagram... = what you can do when the wind is naturally stronger and you don't have to bother sinning. There is a limit to what is worth trying to achieve with a particular kite / board combo you can always improve but the % gain compared to say buying a old bigger board better suited to going up wind in lighter conditions.. In chop and waves and lighter wind, I could whizz up wind on a bigger board with big fins ( a sector 60).. The other points in the video are good advice. I also liked shifting my weight from front to back foot on my TT - gently = tracing an "S" - so visible in the wake - this gave me a good idea of what angles I could achieve going up wind as the power / speed dropped off too much weight up on the front foot = pointing further down wind, to build speed and power then shift weight back a little - and repeat. The video is talking about the kiter's speed impacting the wind direction across the kite. This is most easily noticed when the kite is parked and you are increasing or decreasing speed, but also applies when sining the kite as the total speed of the kite is still impacted by the speed of the kiter. That said, sining the kite adds additional speed to the kite itself over and above the speed of the kiter. Since the speed of the kite generates more power, you get more power for the same kiter speed, therefore more ability to go upwind (if you can use the additional power correctly). Unfortunately, as Jonesy mentioned, sining the kite places the kite deeper into the wind window, so the additional power it generates is actually pulling you from a further downwind angle on average. Making use of both the additional power from the deeper wind window position and the additional apparent wind speed to get a higher upwind angle takes practice to get any advantage over just park and riding, but is certainly possible (especially with faster turning/flying kites). Remember that the further upwind you attempt to go, the slower you will go. Keep attempting to head upwind as much as possible as long as you can keep on the plane (water flowing freely off the back of the board and not spoiling). This will pretty much give you the maximum upwind angle for your setup and incidentally doesn't lose any extra ground due to apparent wind shifting the wind direction. Focus on going as much upwind as possible rather than just going slow. Hi Bones.. I understand your points, if it is all perfectly aligned then yes the extra movement introduces some imperfections (drag profile etc) to this = inefficient.. But I look at it as if I need to sine then the ability to park the kite and ride is limited or non-existent so the downwind angle on that is likely to be up to 100% = down-wind, ... Life's compromises.. But I like the discussion as any beginner / someone needing to make the next step can fill out their knowledge and understand the scope, and shades of grey. I know when I started I felt I had done my dough all new kit.. and it was going to work come what may so I held this as the gold standard, but if I had other kit like I do now for SUP/Surf/foiling I would have been more open/aware of options. So a bigger second hand beat up board to experiment. I was impatient I had ordered the kit and the promoted 145 underground board from NZ was actually on order and not in. So 2 weeks later, once I found out about the ordering issue, I compromised with a 157. In my case looking back, this held me back as too big at 72-75 kg. This was in the pre-snowboard construction days so fibreglass no concaves or sophistication on offer today - I had trouble holding an edge so rarely went out in what I call normal conditions now, and learning took a fair amount of time. So if you are stuck and want to break through and do not have all the time you might like to go kiting to finesse your skill level.. there are likely other options. Hey fellow beginner here. What I believe hasn't been mentioned before is to depower your kite. This might improve light wind performance! Or move near cauncy and hogg his spots haha. Time for that place to get crowded. Oooh surf makes things much more difficult- makes it hard to build up speed which creates apparent wind, every time you try and punch thru a wave you stop dead in the water. Im 94 kegs and ended up buying BIG kites and massive boards (15,18,21m foil kites and 170x50 TT), but even this had limits about 12-13 knots in surf. I ended up getting into hydrofoiling. Light wind just takes time to get good at. Keep trying new things. I found this video recently. Good tips. A lot of light wind riding is equipment and how it's set up.